Golden Sun, how I’ve missed your warm embrace. 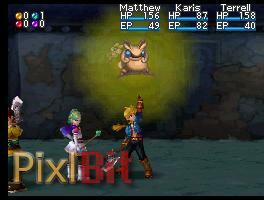 Golden Sun: Dark Dawn cycles to a familiar rhythm, but a brighter presentation makes it all the more inviting. The Golden Sun series is known for keeping its players on their toes inside and outside of battle, something that really enriches the experience. The demo (deftly) accentuated these points by having two different playable portions: exploration and battle. The exploration part of the demo consisted of venturing through an area filled with obstacles needing psynergy's helping hand. Psynergy is the game's equivalent of magic. 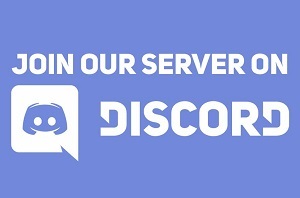 It can be used during exploration, for both progression and puzzle applications, and battle. Some areas required using fire to burn away an obstruction while others required moving objects. Of course, Djinn, elemental creatures linked to psynergy, are encountered along the way. The game seems to be fully playable with the stylus. Normal controls seem to work just fine, too, if I recall correctly. Using psynergy with the stylus was awkward at first, but it worked fine after some handling. Now for a confession: one part of the demo stumped me. It involved a tree that had to be climbed in order to free a Djinni and set a piece of paper on fire to open a pathway. I couldn't climb the tree the first couple of times I attempted it, I guess I wasn't waiting long enough, so I tried lots of other things and ended up wasting a lot of time. The demo was on a time limit, and I was playing it right as the E3 show floor was closing on the last day, so I didn't get a chance to try again. There was probably quite a bit more to this part of the demo that I did not see. 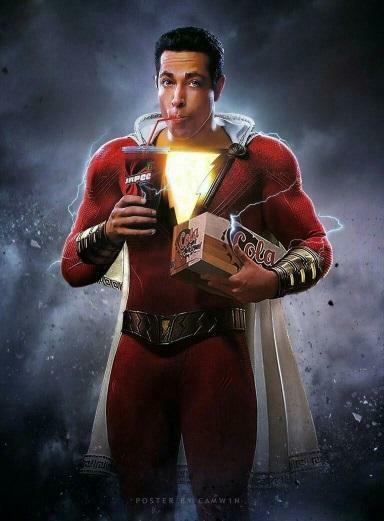 My apologies. I played enough to get a good "feel" of the demo, I believe. The battle part of the demo was relatively straight forward. It consisted of three battles. The first battle had little direction; just fight the enemies in whatever way is seen fit. The second fight suggested that I should use Djinn. (Each Djinni typically has either a beneficial party effect or offensive enemy effect when used.) The third battle was more like a boss battle, and the game suggested I use summons (which become unlocked depending on Djinn that have been used). The battles felt very similar, if not exactly the same, to previous Golden Sun games: attacks, psynergy, items, Djinn, summons, etc. I personally don't mind that at all, but players who don't like this form of gameplay should be aware of what they're getting into. And of course, the whole game had a graphical update. The game looks beautiful, complete with all the environments and stunning spells and summons the series is known for. It wasn't as drastic an update as I was hoping for, but it was still nice to see different effects, a cleaner display, and a more realized 3D feel. As for the sound, it was difficult to hear on the show floor, but it sounded like it had the same charm previous Golden Sun games upheld. After completing the battle portion of the demo, I was able to walk around a town, which detailed more of the story's setting. 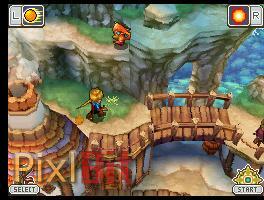 The story seems to be taking place after the first two Golden Sun titles. Players who haven't played the first two entries, the second being highly dependent on the first, should be able to smoothly dive into Golden Sun: Dark Dawn's story. The demo explained enough of the back story to make sense of the game's current events. 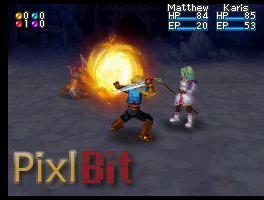 Fans of the Golden Sun series can immediately kick off their shoes and feel right at home. 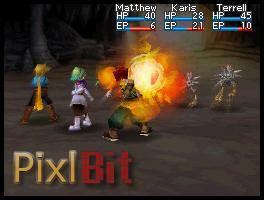 Golden Sun: Dark Dawn, at a demo glance, maintains much of the presentation that the series' previous entries constructed. New comers to Golden Sun may find the game to be a little dated, but subtle refinements on the Golden Sun formula for the jump from the Game Boy Advance to the Nintendo DS may be enough to keep new players hooked. Either way, if you're a classic RPG fan, you probably won't want to pass this one up when it releases this holiday season. I love, loved, loved the first two games! Yeah now they can make you pay for it a few more times, way to go nintendo. 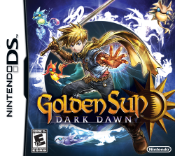 I haven't heard anything about the first two Golden Sun games being included with Golden Sun: Dark Dawn. 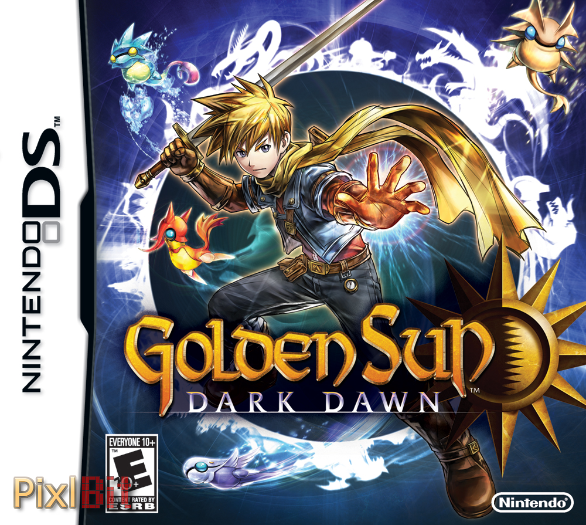 I think you'll be fine to play Golden Sun: Dark Dawn; I don't think missing the first two will hurt much. The demo made me feel that the retail version won't "require" knowledge of the first two games. Although, if you have a GBA, DS Phat, or DS Lite, you might want to just pick up the first two on Amazon if you want to learn more of what happened outside of Golden Sun: Dark Dawn. They're pretty meaty games; worth the price in my opinion.